At 4-8, the 2015 Saints are staring down the barrel of their worst season under Sean Payton. The Saints’ defense is as bad as one might imagine an NFL defense can be. 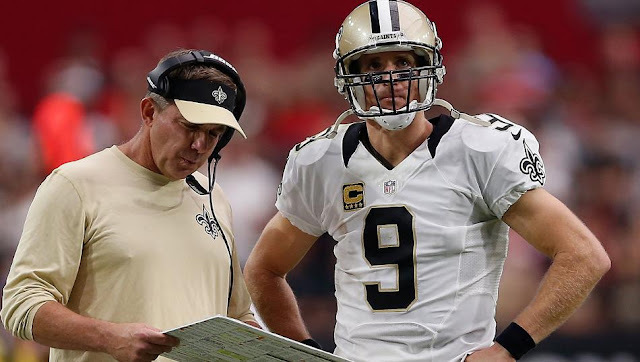 The offense, while capable, represents the least imposing unit under Payton’s direction. The special teams have suffered through a rotating cast of kickers, punters, and returners. Injuries have abounded. The roster is shallow, combining a core of older players with a collection of inexperience and youth. The Saints’ salary cap is in poor shape—among the league’s worst—and will remain stretched thin in 2016. To these woes you can add uncertain futures for both the quarterback and the head coach. Drew Brees is headed into the final year of the contract he signed in 2012. The Saints owe him a $19.75 million base salary next year that carries a daunting $30 million cap charge. Conventional wisdom says the Saints will extend Brees’s contract, mitigating the 2016 cap hit by signing Brees to a more team-friendly contract. 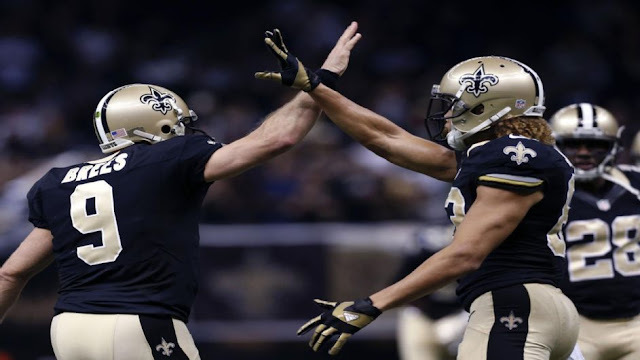 With the Saints' 2016 salary cap already in poor shape, however, the Saints might let Brees play out his current contract and wait another year to determine his future with the franchise. Less likely scenarios involve trading or cutting Brees after this season. Trading or cutting Brees would generate a significant cap savings that would shift the franchise full throttle into the wilderness of "rebuilding." Also unlikely, but possible, is that Brees will simply retire after this season. Right now, you’re looking at: a.) Brees’s final four games as a Saint; b.) another contract that keeps Brees in New Orleans for another three years or so; or c.) a farewell tour in 2016 as he plays out his current contract. Intertwined with this is Sean Payton’s future as the Saints’ head coach. Payton is under contract in New Orleans for 2016 and 2017, though that does not preclude him from leaving at the end of this season. The rumors of Payton departing New Orleans have been consistent (if not rampant) this season, and with all the smoke, there’s probably a fire lurking somewhere. Does Payton want a fresh start elsewhere next year? Is he angling for a contract extension in New Orleans in the face of a tenuous ownership situation? Is the NFL media just drumming up filler because it sells? For his part, Sean Payton has steadfastly maintained his commitment to New Orleans all along this year. During games, he’s been animated and intense and engaged for the most part. By his words and actions Payton looks invested in the Saints, though these final four games might change his mind. It's not out of the question that Payton is keeping his options open while his value is high, all the while attempting to mask those intentions. If Payton stays in New Orleans, he is faced with rebuilding his defense (again) while continuing to overhaul the roster with talent and youth. Though the 2015 draft has produced positive results for the Saints, they’ve been blunted by the contracts the Saints have recently dispensed. No contract failure is more glaring than that of Junior Galette, who hoodwinked the Saints before getting cut and saddling the team with a load of dead money. Lucrative contracts for Jimmy Graham, Jairus Byrd, Brandon Browner, CJ Spiller, and Keenan Lewis have not proven worthy either. For a premium price, the Saints have received middling-to-poor returns and a bloated salary cap. Those results might reside in the wisdom of signing said players, yet they also might point in another direction: coaching. Why have players with extensive track records of success like Byrd, Browner, and Spiller failed--some spectacularly--in New Orleans? Are they damaged goods? Past their primes? Unmotivated? Or are they miscast and poorly prepared? When you consider this in the context of former Saints having success in new locales—notably Malcolm Jenkins, Roman Harper, and Patrick Robinson—it’s fair to question whether the Saints’ coaches are capable of properly utilizing the resources at their disposal. Looking ahead, not only do the Saints need better players on their roster, they also need better coaches on their staff. I’d argue that the coaching element is more important, especially with a roster that will be getting younger. With four games remaining this season, the Saints face as much uncertainty as they have since early 2012. Big changes are ahead. Sean Payton has been with the team for ten seasons, an eternity for an NFL head coach. Drew Brees will soon be 37 and pondering his NFL endgame and life after football. The roster rebuild will continue. A defensive reboot will once again be on the way. The Saints’ final four games won’t simply impact the team’s 2016 draft position, they will influence whether Sean Payton and/or Drew Brees return in 2016. If this is the last we see of the Payton-Brees combo in New Orleans, enjoy it. It has been one hell of a fun ride. The Payton/Loomis regime was always crashing down at some point. This is an inescapable reality for every NFL team in any given era. Two weeks into the 2015 season, here we are faced with the ugly truth: the end of the greatest era in Saints football is on the doorstep. For the third time in four seasons, the Saints have started 0-2. They're 7-11 in their last eighteen regular season games. They’re in a tailspin of increasing ferocity. The modern Saints are a team built on offense, and today, that offense is a shell of its once formidable self. Since 2013, the Saints have parted ways with a long list of productive offensive players: Darren Sproles, Pierre Thomas, Chris Ivory, Lance Moore, Jimmy Graham, and Kenny Stills. To date the Saints have failed to suitably replace this talent and as a result, they are no longer capable of winning games on the strength of their offense—the once signature talent of Payton’s Saints. In the first two games this year, the Saints offense has looked passive, non-threatening, meek. This is a trend that started in 2013, bled into 2014, and seems to have cemented itself permanently in 2015. They’ve failed to push the ball downfield. They haven’t run the ball particularly well. They seem to call screen passes every other play. They strike no fear. It’s reflective of an offensive system now unimaginative and lazily, contentedly growing old. When the Saints offense dies, so dies the Payton-era Saints. It appears we’re witnessing the death rattle. Of course the buck stops with Sean Payton who, in my opinion, is in need of a fresh start. Who would’ve thought Payton would ever take the ball out of Brees’s hands when the Saints had a chance to steal a win in Arizona late in the game? Who could foresee Payton punting from the opponent’s 35-yard line on the game’s opening drive at home against the lowly Bucs? It’s been ten seasons in New Orleans for Payton, well past the average lifespan for an NFL head coach with one franchise. When you take into consideration the monumental task of rebuilding the Katrina team; the Super Bowl run; the Vicodin incident; Bountygate; a divorce; and whatever else we’re not privy to, it’s perfectly understandable to see why Payton is no longer at his best in New Orleans. We really shouldn’t fault him for a natural course of events. After all, he did the impossible in 2009. Duplicating that task was always going to be a fool’s errand, and he damn near did it anyway. In recent years, he’s been hamstrung by his team’s drafts and contract management. The list of follies is almost endless at this point: extending the contracts of older guys like Roman Harper, Will Smith, Marques Colston, and Jahri Evans; a brutal track record in the draft embodied by Stanley Jean Baptiste; a mindless, poisonous contract extension for Junior Galette; the confounding Jairus Byrd experience; and spending valuable cap space on a luxury (C.J. Spiller) when you lack the basics (a #1 wide receiver, or a functional tight end, or a pass rusher). This offseason, the Saints handed out hefty contracts to two runningbacks (!). Considering the Saints’ knack for finding cheap, young talent at runningback over the years, and with cap dollars at a premium, this was an errant choice with so many other holes at the time: wide receiver, tight end, cornerback, linebacker, and defensive line. All of these missteps have eroded the Saints’ ability to compete, and it culminated in a home loss to a rookie quarterback on one of the league’s worst teams, a team that, the week prior, lost despairingly to a Tennessee Titans’ team that in week two lost badly to the hapless Cleveland Browns. This is where the Saints have arrived in 2015. At the bottom of the barrel. They’ve lost six straight home games, their worst such streak since (gulp) 1979-1980. And if there was ever one event that would push the Payton/Loomis Saints off the cliff, it was an arm injury to Drew Brees. 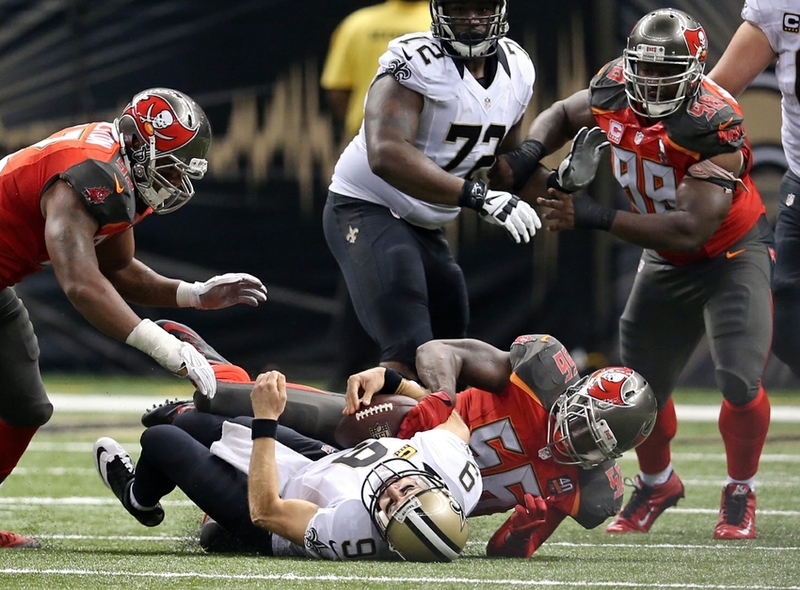 Sadly, that might have happened when Brees took a nasty shot while following through on a pass against the Bucs. It might have been a fatal shot. In 2014, Brees quietly labored through a rotator cuff injury. And since 2006, Brees has thrown an insane number of passes for the league’s pass-happiest offense. He is 36 with a significant amount of wear-and-tear on an already-once rebuilt arm. I've never seen Brees as down at a post game presser as I have today. Maybe it will all turn out to be nothing, and Brees will be fine. But from what we saw on Sunday, and considering Brees’s age and his past, it’s time to brace for the worst. In the Saints’ past eighteen games, the team’s decline has proved precipitous and at this point appears irreversible. It was always going to end like this.